Shows anterior, posterior and superior views of the heart. Also illustrates right and left ventricles, heart valves and blood circulation. 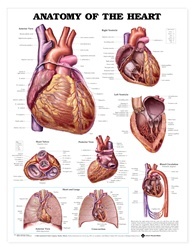 Provides cross section and anterior view of the heart and lungs.